Similar to the mom n’ pop business that’s the main setting of the films, the Barbershop franchise has prolonged its existence longer than most people originally expected it to. The first entry in the series is a pleasant mix of good-natured comedy, finely tuned bits of drama, and a solid reinforcement of the importance of community. The 2004 sequel, Back in Business, did a respectable job at maintaining the structure, and also constructing an undercurrent to the real-world gentrification of urban neighborhoods. Flash forward twelve years and we have a third film in the trilogy, which at first glance looks like a cash grab for MGM Studios to milk one last dollar out of the series. To my astonishment though, Barbershop: The Next Cut is a late sequel that’s just as enjoyable as its predecessors, and even more timely in the real world themes it explores. Ice Cube returns playing Calvin Palmer, who has continued to operate his father’s South Side Chicago barbershop for close to two decades. The shop has also undergone renovation with an adjoining beauty salon run by his friend Angie (Regina Hall). While keeping the business afloat, Calvin has to contend with family issues regarding his now teenaged son who’s starting to affiliate himself with a local gang. With the gang issue continuing to grasp a stranglehold on the neighborhood, Calvin and the staff decide to take action by using the shop as the center for a ceasefire between the surrounding gangs. One of the biggest strengths the trilogy has had is the snappy dialogue between the characters. Every topic that the shop staff discusses, whether it be race or pop culture-related, flows in a very natural manner that clearly defines the characters’ personalities. There are a few points where the punchlines to certain conversations don’t hit their mark, but it’s a flaw that’s far outweighed by the substantial amount of ones that still got a good laugh out of me. The majority of the best one-liners come once again from Cedric the Entertainer as Eddie, the oldest employee of the shop that spends more time going on diatribes than actually cutting hair. The ensemble cast is ample in conveying the film’s warm sense of togetherness, and Cube at the helm of it is the best he’s been in the series. He succeeds very well in the film’s more dramatic scenes, and it fits well in how real of a character Calvin Palmer is. While he’s passionate about his business and the city he lives in, there’s a sense of fear that still lingers for preserving the safety of not just himself, but also his family and fellow employees. Cube as well displays a solid camaraderie with rapper-turned-actor Common, who plays his closest friend/fellow barber Rashad. There is one character however I was conflicted on, and that was Nicki Minaj as one of the hairdressers in the adjoining salon who may or may not have interest in a relationship with the already married Rashad. Minaj is okay in the role, but her character serves no purpose other than being a device to the tiresome “my husband might be on cheating me” subplot. Lastly, Minaj’s rear end deserved a screen credit of it’s own because there were numerous instances where the cinematographer framed shots that were so obviously fixated on it. Although the film is mainly labeled as a comedy, the dramatic heft of story should not be ignored. The opening credits and closing scene construct a thoughtful love letter to The Windy City, which is ironic because aside from aerial shots, the rest of the movie was shot in Atlanta. Regardless, the approach is used to bluntly address the gang problems and violence that have been prevalent over the years. The filmmakers have an answer to the problem that would only exist in the world of movies, but it nonetheless deserves recognition for how forthright it is with spreading awareness of its allegories to even bigger audiences. 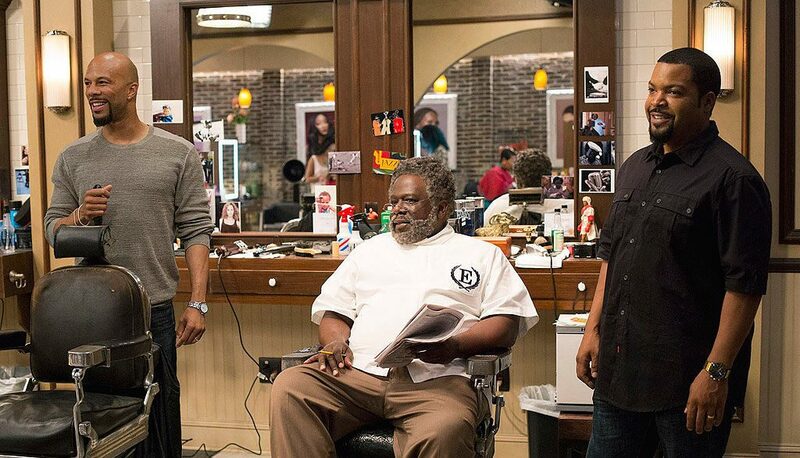 Aside from some banal subplots that function as nothing more than filler for the 112 minute runtime, Barbershop: The Next Cut succeeds with its charming cast, endearing dialogue and timely sociopolitical subject matter. After eleven years since last visiting Calvin’s Barbershop, returning as a customer for the third time was certainly worth matinee price.